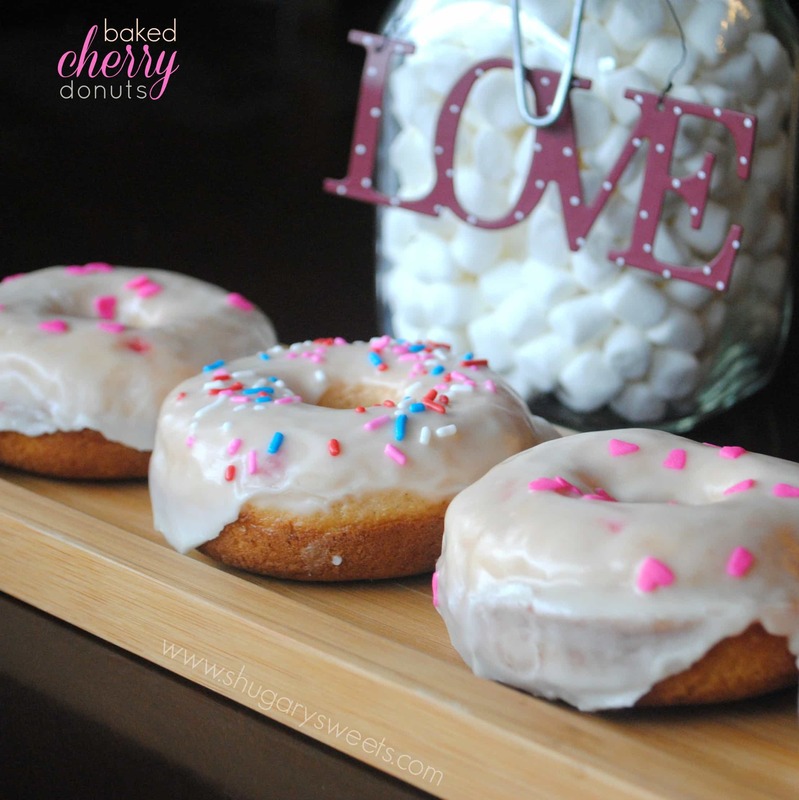 Easy Cherry Donuts that bake up in no time! Don’t forget the sweet vanilla glaze! Last week I surprised my youngest daughters with fresh donuts for breakfast. Yeah, baked donuts are THAT easy! 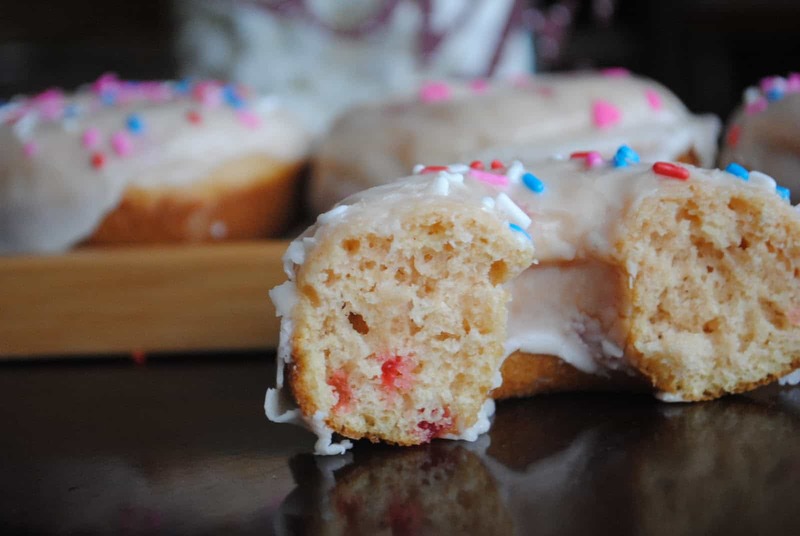 If you haven’t gotten around to trying them, maybe these juicy cherries inside a cake donut will persuade you???? In mixing bowl, add flour, sugar, baking powder, baking soda, salt and nutmeg. Mix until combined. Add in eggs, vanilla, milk and melted butter. Mix thoroughly. Fold in chopped cherries. Pour batter into a ziploc bag, snip off the corner of bag. Pipe into greased donut pans. Bake in a 325 degree oven for 10 minutes. Remove and allow to cool in pans 5 minutes before removing to a cooling rack. For the frosting, heat cream in small saucepan until just before boiling. Remove from heat and whisk in vanilla extract and powdered sugar. Add more cream (or powdered sugar) until desired consistency. To frost donut, dip cooled donut into glaze. Set on wax paper, apply sprinkles immediately (if desired), and allow to set (about 15 minutes) before eating. Enjoy! It’s a donut kind of day! Those look delicious! Thank you SO much for this non-chocolate baked donut recipe! I can now bake my favorite (cherry!) and modify it for my lemon donuts! Fantastic! I do love cherries-yum! Usually cake donuts are very basic flavors, so I am glad to see a donut batter that has more unique flavor to it! I am saving this recipe! The donut pan is on the list to get at the end of the month. Great post. I’ve never had a cherry doughnut before but it sounds great! Icing is perfect. I should make these for my boyfriend! He would love these! At our local farmers market in the summer there is always a stand with cherry doghnuts! Oooh, these look so pretty! 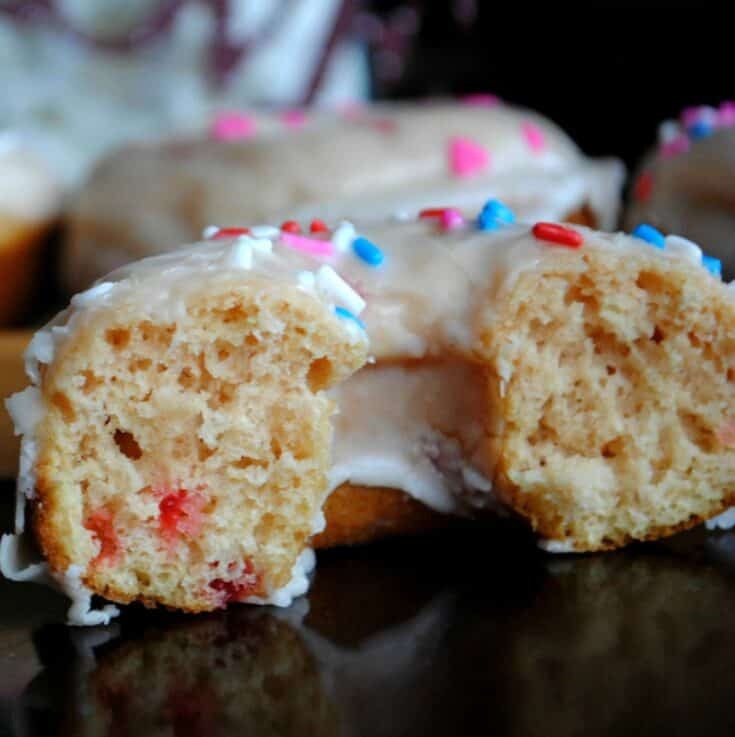 I am not hugely into donuts, but my wife loves them and would devour a whole batch in no time 🙂 Great recipe! Oh my gosh oh my gosh oh my gosh!!! These are amazing! There was this grocery store back when I lived in PA that had a cherry donut like this and they were my favorite…thank you SO much for sharing this. Made my day! Oh yum!! I love cherries . . . and in donuts?? Brilliant!! Time to dig out my donut pan…yours look so tempting with that yummy glaze! Baked doughnuts will fit nicely in my low fat diet right now!! 😉 Yum- me! 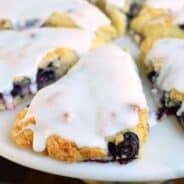 I always love the amazing recipes you post! Yum! I just bought a heart shape pan and these would be so pretty to go in them! Thanks for the recipe!! Can’t wait to try it. I love how easy donuts are! These are beautiful and sound so good too. Thanks for sharing on Crazy Sweet Tuesday! oh, now this I must try! I’m drooling…those look so good! 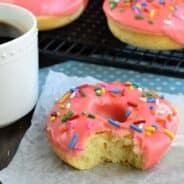 I never even consider making donuts..this recipe is easy enough to try..thanks..oh my family will love it!! Yes, yes, yes, yes, yes! I WILL be making these! These look AMAZING! I can’t wait to try this recipe!! I am going to attempt to make these today. Can I freeze them and frost them later? Absolutely. =) It’s just me, so I freeze stuff all the time, donuts freeze great. Yum, sounds delish. Glad you enjoyed the recipe! Just made these, yummy! However I do not have a donut pan so I used my mini muffin pan & worked great! 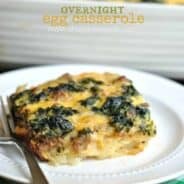 Easy & quick recipe! Is there a way to I corporate a really good cherry spread/preserve instead of maraschino cherries?